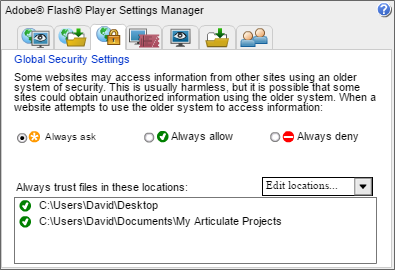 If you launch a published Articulate project on your local computer and just see a spinning circle or a Flash Player notification, you may be experiencing a new security feature introduced in Flash Player 23 that disables local playback of Flash content. 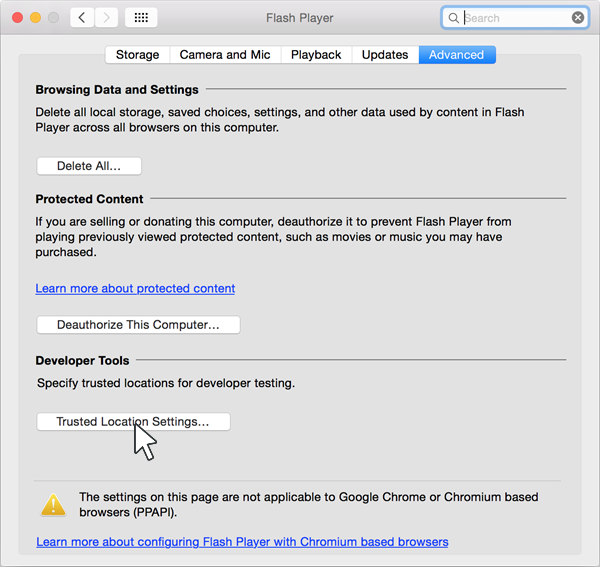 Launch the Flash Player settings manager in your browser. Click the Edit locations drop-down list and select Add location. The next time you launch a course in Google Chrome that was published to one of your trusted locations, it’ll work as expected. Another option for viewing projects without local security restrictions is to publish for CD, then double-click the launch file in your published output. Launch your published course in Internet Explorer, then right-click the spinning circle or the Flash Player notification box and choose Global Settings. 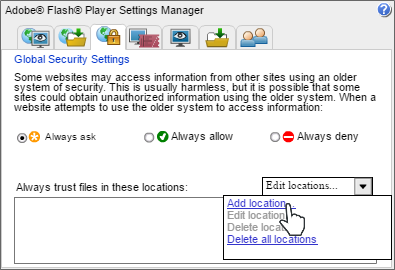 When the Flash Player Settings Manager opens, click the Advanced tab at the top of the window, then click Trusted Location Settings. 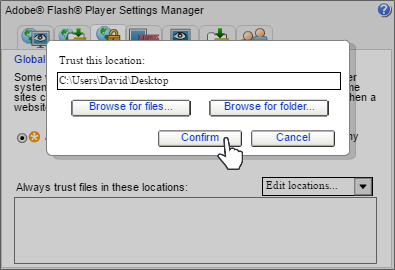 Click Add in the lower left corner to add a new trusted location. 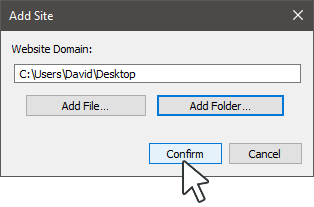 When the Add Site window opens, click Add Folder, browse to a folder where you often publish Articulate content, then click Confirm. 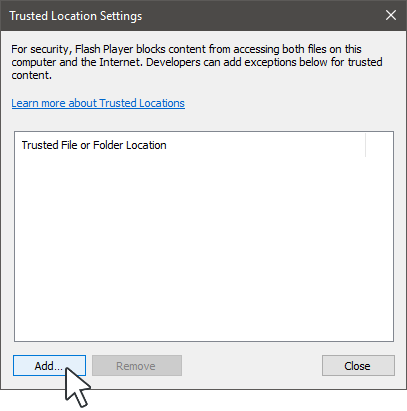 Repeat steps 3 and 4 to add additional trusted locations, then click Close to exit Trusted Location Settings. The next time you launch a course in Internet Explorer that’s located in one of your trusted locations, it’ll work as expected. Another option for viewing projects locally without security restrictions is to publish for CD, then double-click the launch file in your published output. The next time you launch a course in Microsoft Edge that’s located in one of your trusted locations, it’ll work as expected. 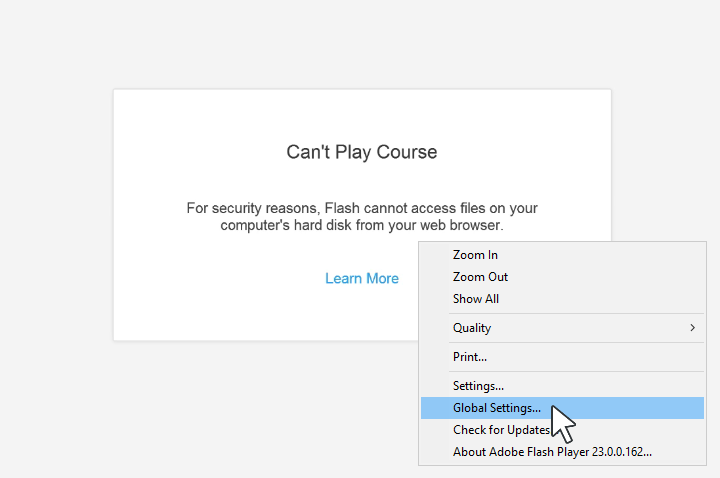 Launch your published course in Firefox, then right-click the spinning circle or the Flash Player notification box and choose Global Settings. 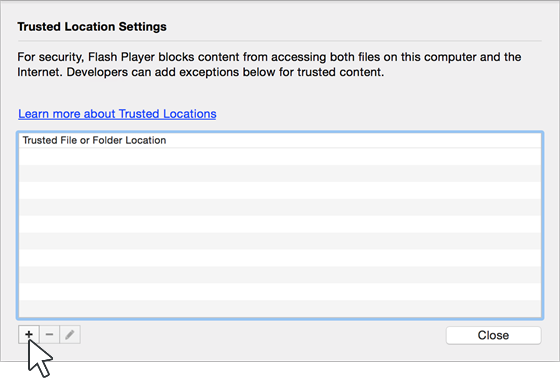 Repeat steps 3 and 4 to add additional trusted locations, then click Close to exit Trusted Location Settings. The next time you launch a course in Firefox that’s located in one of your trusted locations, it’ll work as expected. 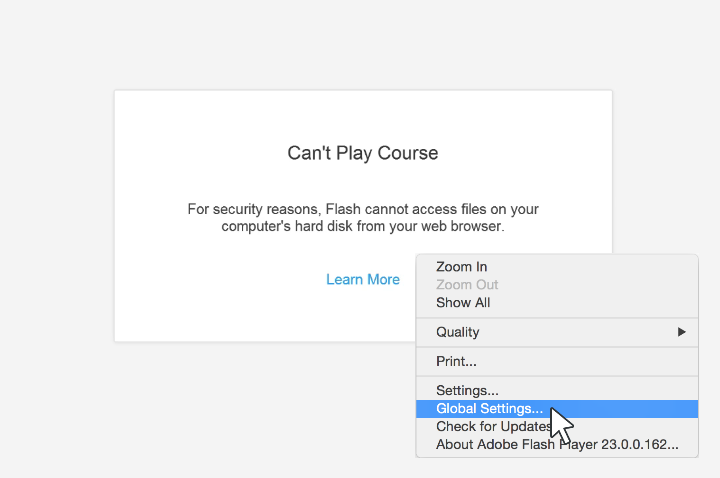 Launch your published course in Safari, then right-click the spinning circle or the Flash Player notification box and choose Global Settings. 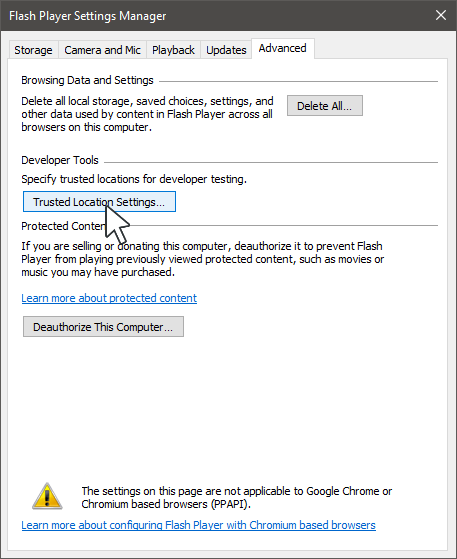 When the Flash Player settings open, click the Advanced tab at the top of the window, then click Trusted Location Settings. Click the plus sign in the lower left corner to add a new trusted location, then browse to a folder on your Mac where you store published Articulate content and click Open. 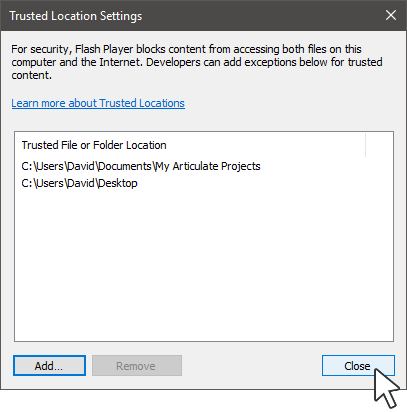 Repeat step 3 to add additional trusted locations, then click Close to exit Trusted Location Settings. 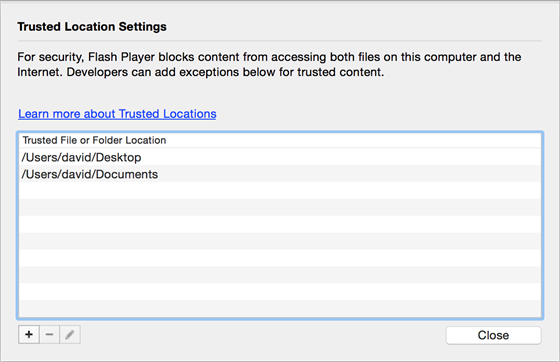 The next time you launch a course in Safari that’s located in one of your trusted locations, it’ll work as expected.